Taking a little break from the blog last week really got me inspired and I can’t tell you how excited I am to share the new 2015 Coastal Virginia Magazine Idea House. 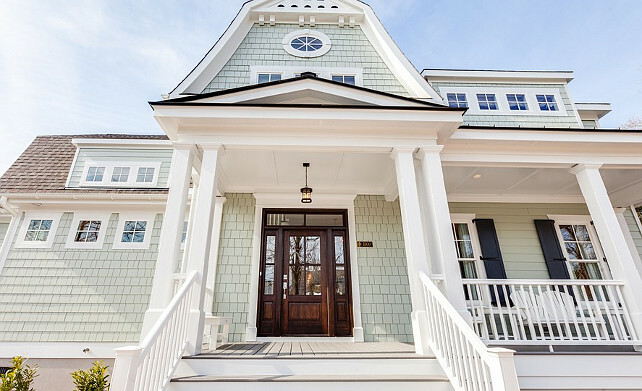 This stunning Virginia Beach house is located only a couple of blocks from the beach and it was meticulously built by one of my favorites builders, Stephen Alexander Homes & Neighborhoods and designed by Susan Wilson of Goodwin Interiors. As an interior designer, I have a great appreciation for her ability to keep all the rooms feeling connected yet keeping their own identity. 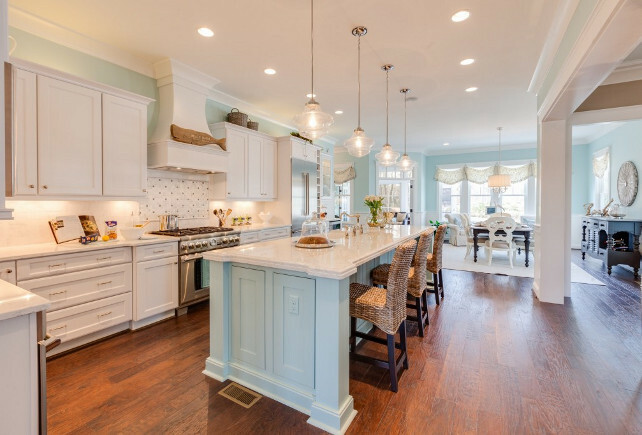 This beach house has 3,930 square feet, 5 bedrooms, 3 full baths and 2 half baths. 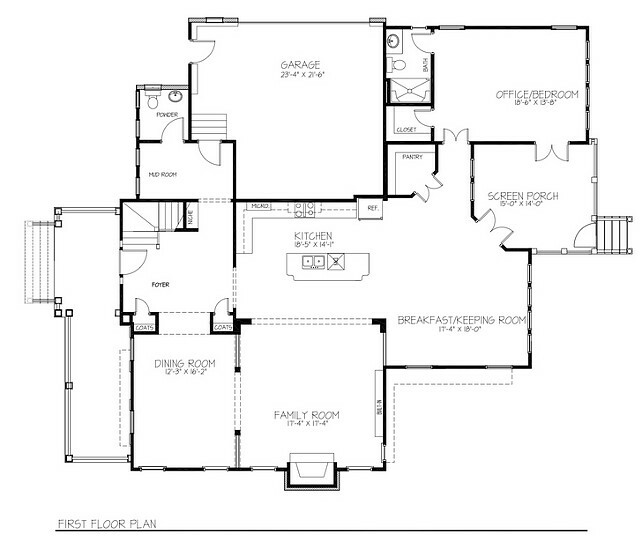 It comes with a very inspiring open floor plan (shared at the end of the post). We will also see the ultimate coastal color palette with creams, white, aqua, turquoise and pale grays. Nothing was overlooked in this home, from the decor to the timeless architectural details with a casual yet elegant approach. 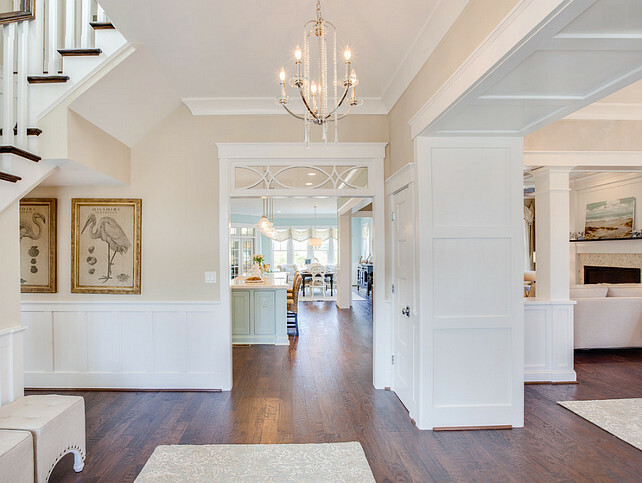 Master trim work on both floors of the home stands out and elevates its charm to a new level. 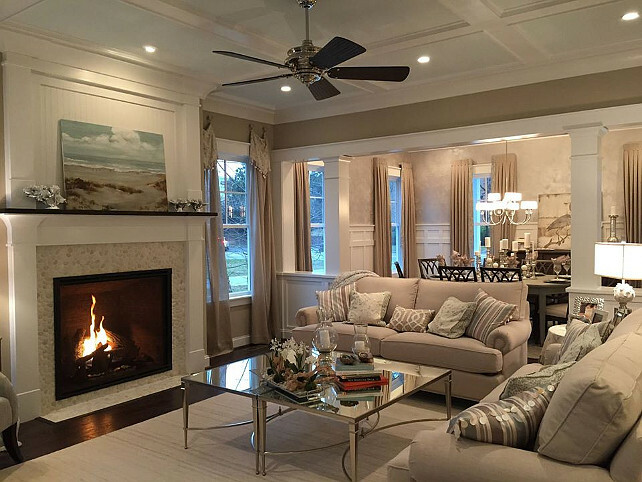 Look for a coffered ceiling in the main living space, five-panel doors, interior transoms, and high-end molding—picture frame, beadboard and crown—throughout. 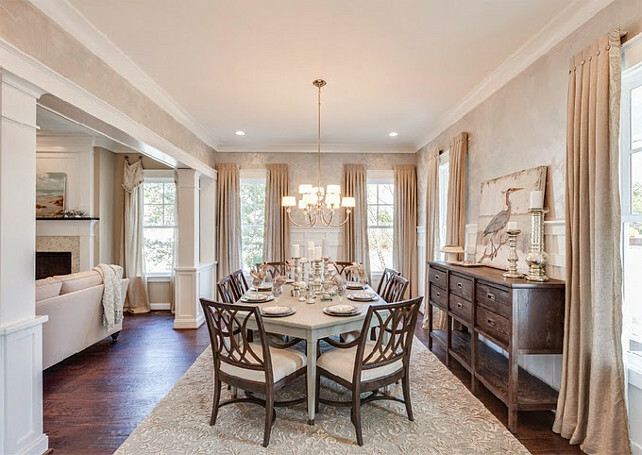 Take notes on paint colors, lighting, furniture and many other sources. Save this information or pin it for future reference. I am hoping they become useful for you. 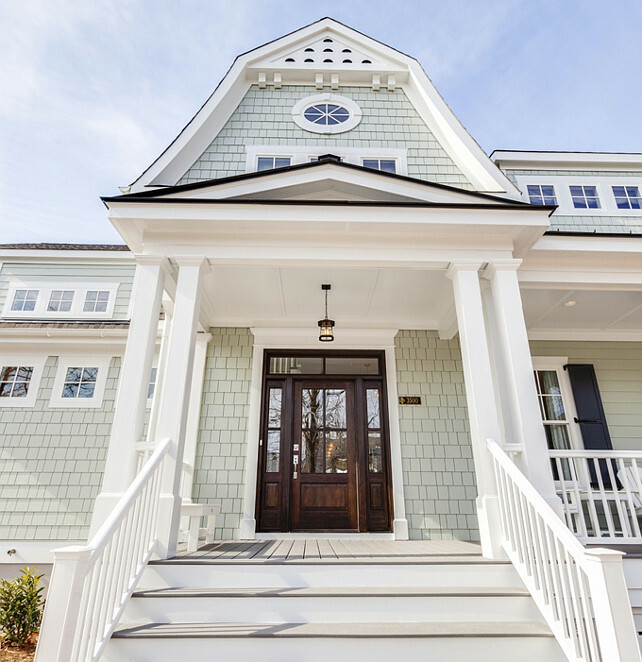 Even before your entrance to the house, plan to be awe-struck on the approach as you take in the nostalgic, Nantucket-style architecture that is described as the “epitome of a coastal lifestyle”. Alluring architectural details include cement, cedar shake siding; grouped and small square windows; and a wooden door with glass panels, sidelights and transom. Most impressive, of course, is the can’t-miss Gambrel roof (one of my favorites! ), with a beautiful oval window and subtle gingerbread detailing at the peak. Isn’t it impressive?! Outdoor Lighting: The craftsman style lantern is from the Progress Lighting Derby Collection. 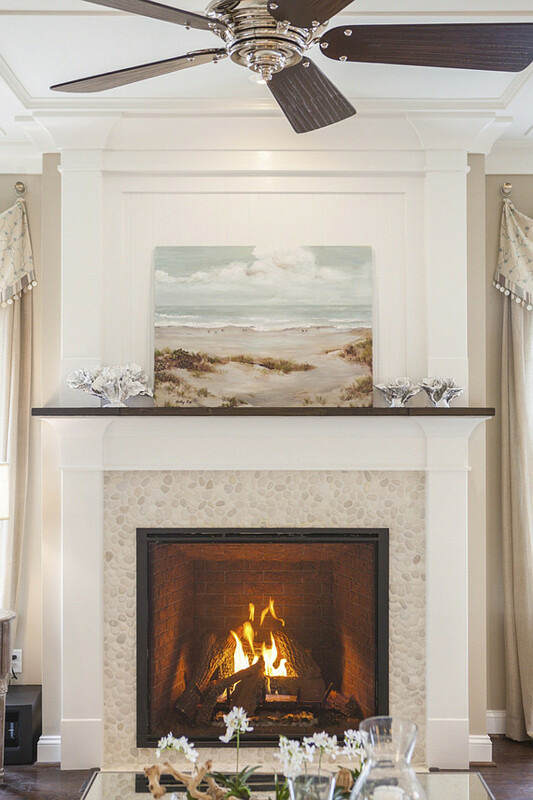 The Coastal Virginia Magazine Idea House offers the perfect balance of elegance and coastal casual living at the North End of Virginia Beach. Simply beautiful! 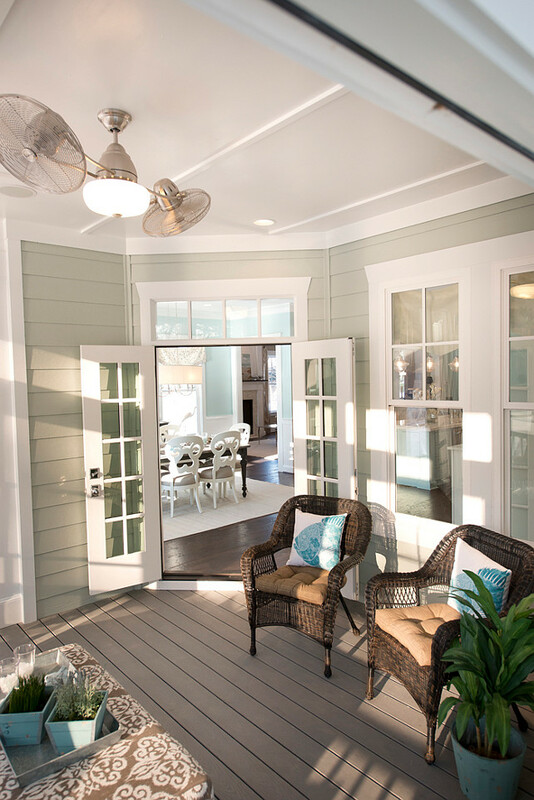 As soon you enter this beach house, you notice how this home is bathed in a stunningly subtle tint of sea mist green with undertones that reminds you of a breezy day at the beach. Notice the gorgeous transom window. Chandelier is the Nissé chandelier by Progress Lighting. 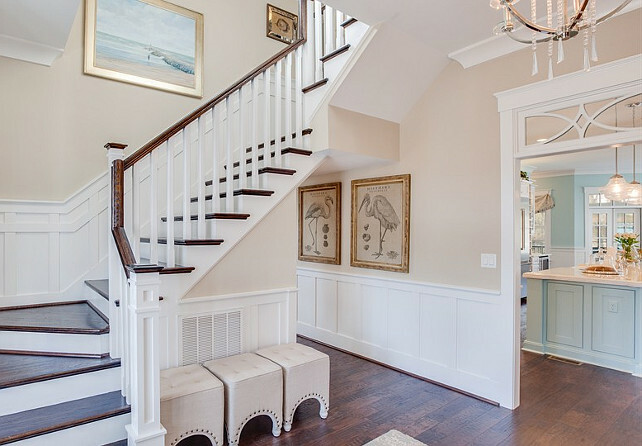 The beach sand paint color used in the foyer is Sandbar by Sherwin Williams. 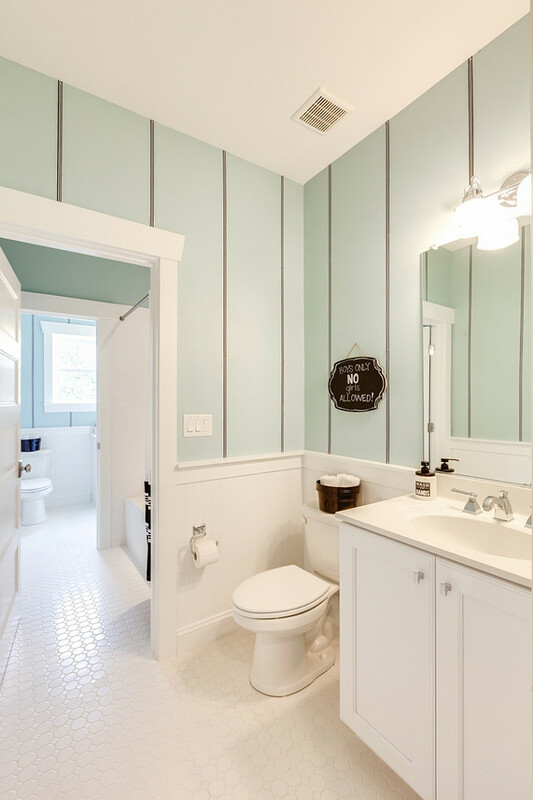 In my opinion, one of the best crisp white paint color for base boards and millwork is Sherwin Williams SW7005 Pure White in an exterior acrylic latex paint. This will assure more resistance and durability. A deep portal between the dining room and the foyer not only allows space for two flanking coat closets, but provides visual separation without bulk while drawing people in, as do paneled knee walls with square column details between the dining and family rooms. 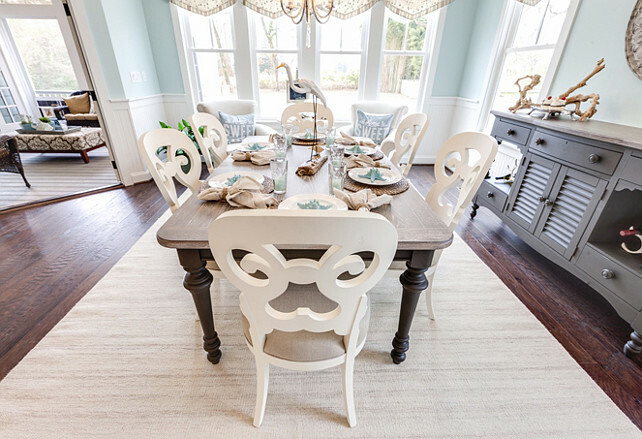 All the furniture used in this house is by Espirit Décor Home Furnishings from “Coastal Living” collection by Stanley Furniture. Above, a gray-washed hexagon table offers a unique way of accommodating more guests around the table when entertaining. I love this idea and wish I had it at home. Dining table is Stanley Furniture Coastal Living Resort Soledad Promenade Dining Room Set. Table stain is in “Urchin”. Dining chairs are the Coastal Living Resort-heritage Coast Arm Chair In Channel Marker. Sideboard is the Coastal Living Resort-sundown Retreat Sideboard In Channel Marker. 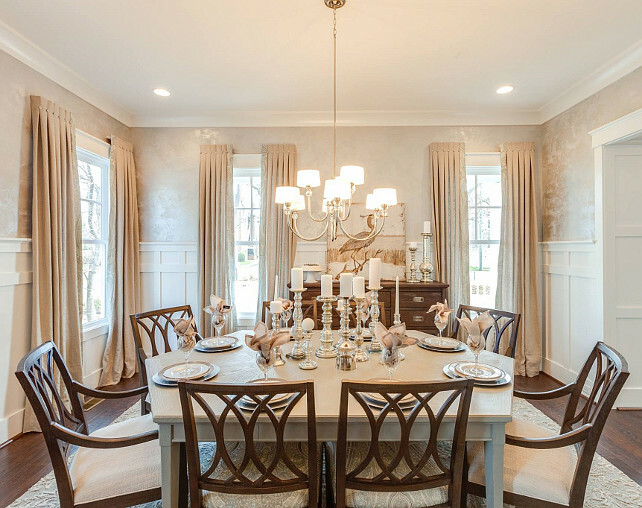 The dining room chandelier is the Fortune Chandelier from Progress Lighting. Beautiful! The mica wall treatment was done by Brum Faux Finishing. 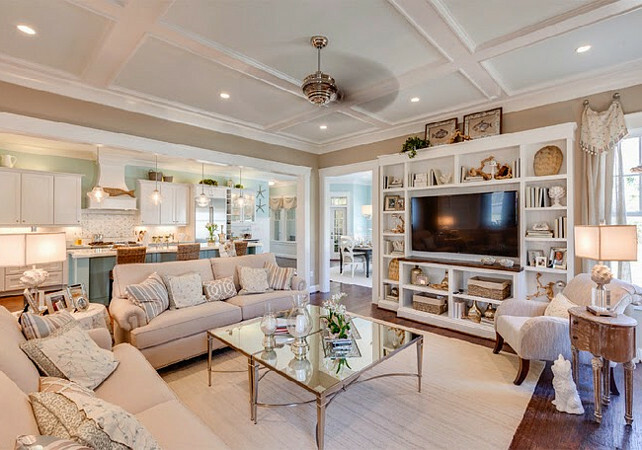 High-end, perfectly proportioned, crisp white moldings, casings, wainscoting, built-in bookshelves, five-panel doors and a coffered ceiling in the main floor family room unify the spaces with a clean, streamlined look that creates an effortless continuity. The living room paint color is Sherwin Williams SW7506 Loggia. 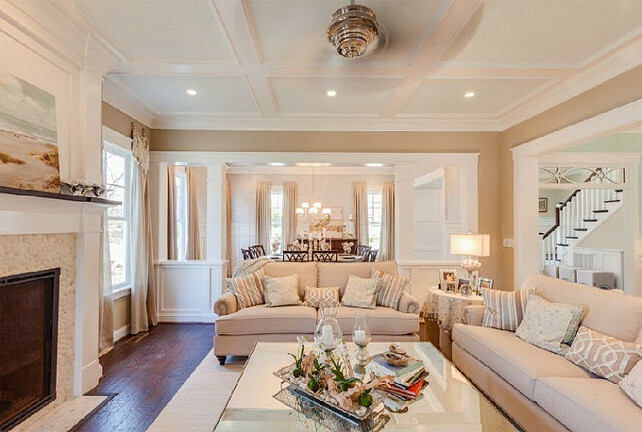 Coffered ceiling paint color is Sherwin Williams SW6476 Glimmer. 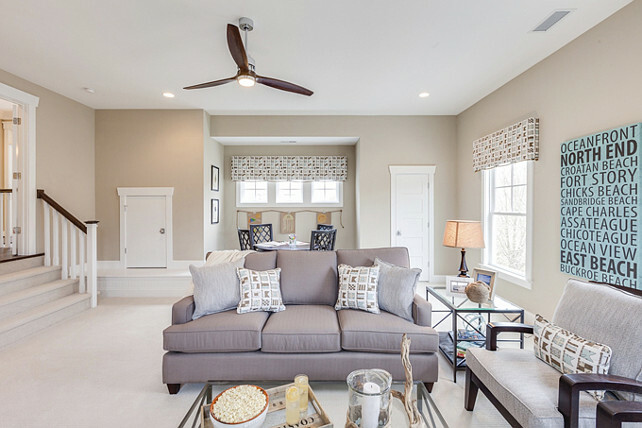 The living room is cozy and perfect for catching up with family or simply relax. Also in the living room, an identical pair of antique-mirrored coffee tables and a long narrow sofa table reflect the abundance of light drenching this home. I love the decorative details found in this house. Pay close attention to them. They’re so inspiring! 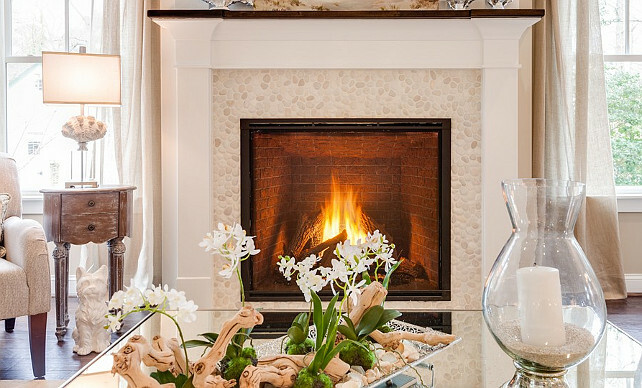 The fireplace tile is Antique Timor White. 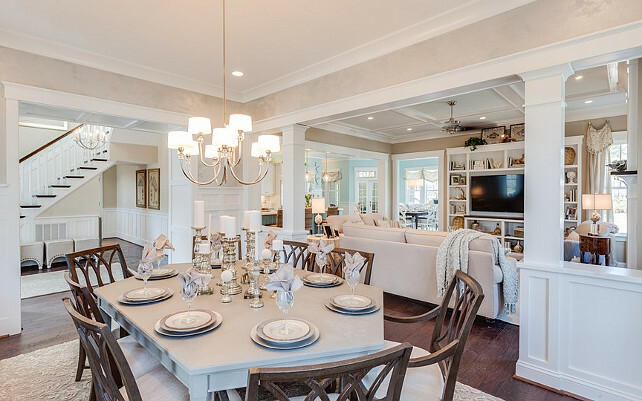 A signature of Stephen Alexander homes is open and airy living spaces, and the Coastal Virginia Magazine Idea House takes this family-friendly feature to a new level with a 13-foot kitchen island (able to accommodate five barstools) that serves as the hub of the home. 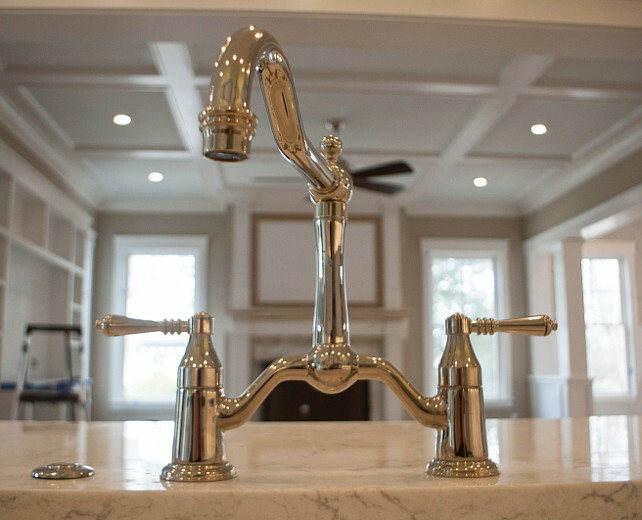 The kitchen also offers a huge, farm-house sink, separate wine bar and inset cabinets. 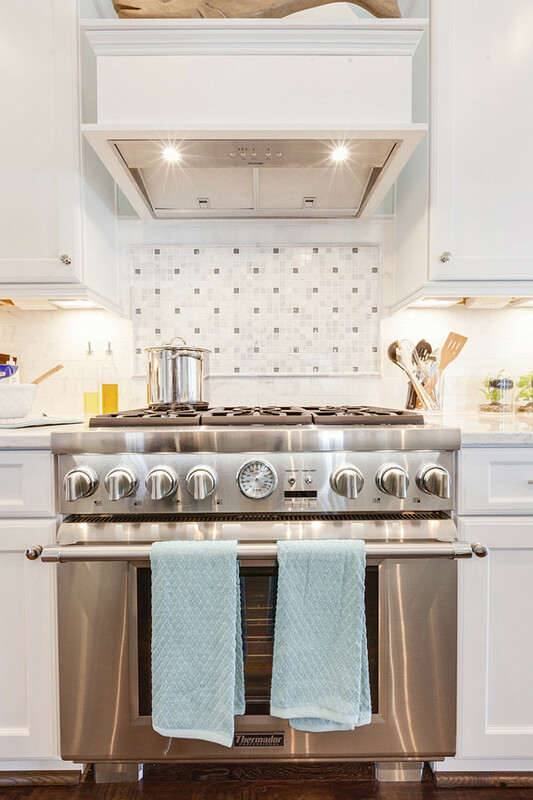 The centerpiece of the expansive coastal kitchen with its professional-grade Thermador appliances—including a 38-inch, French-style hood over the deluxe range—is a custom, 13-foot kitchen island with furniture detailing. As interior designer Susan Wilson of Goodwin Interiors, Inc., notes, “The ample size was needed to match the magnitude of the space.” According to the builder, Alex Quick, its double thickness of white countertops similarly provides for visual heft that is harmonious with the volume of the kitchen space and in keeping with the ambiance of the home. White inset and glass-front cabinetry continues the crisp look of the custom millwork through the kitchen area, contributing to the feel of seamless transition by further opening and brightening the space. 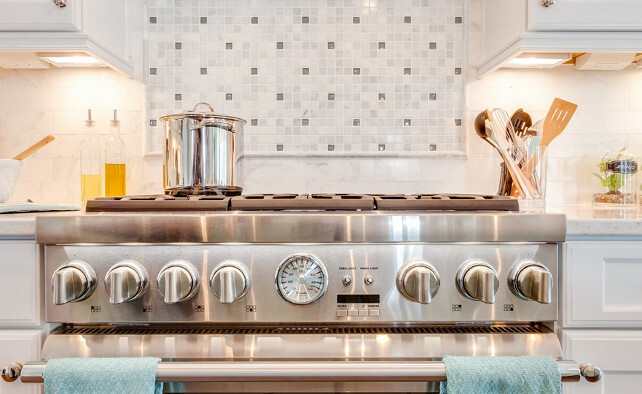 Stunning and shiny… I want this range by Thermador! The wall paint color is Sherwin Williams SW 6477 Tidewater. Trim color: SW7005 Pure White. 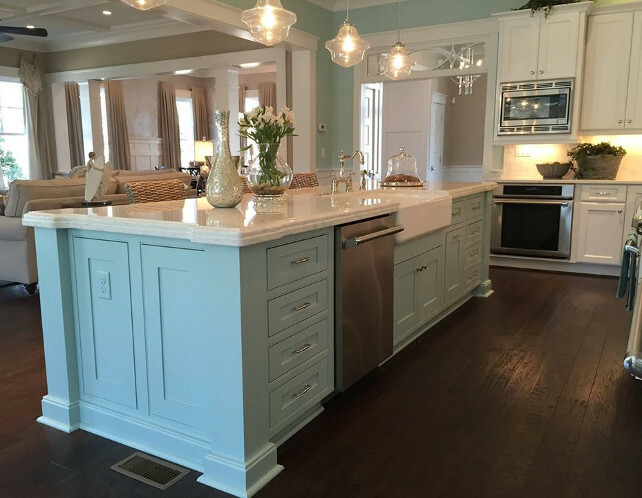 The blue kitchen island paint color is Watery SW6478 Sherwin Williams. 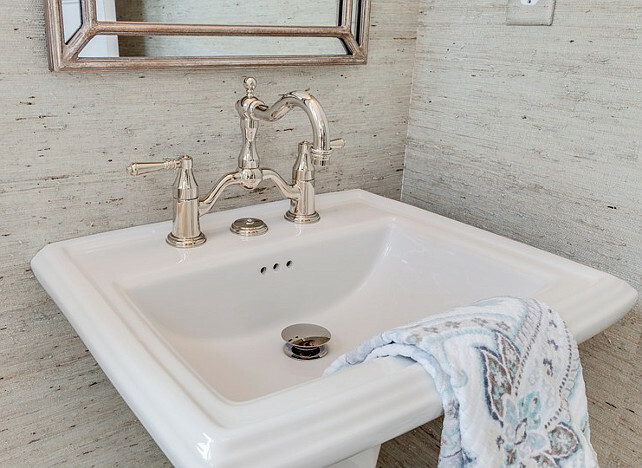 The beautiful and soothing countertop is Viatera Quartz – Minuet – A heat resistant, scratch resistant, spill proof, antimicrobial quartz product – More expensive than marble but alleviates all of the inherent weaknesses of Marble. Sink is a 36” Kohler farmhouse sink. 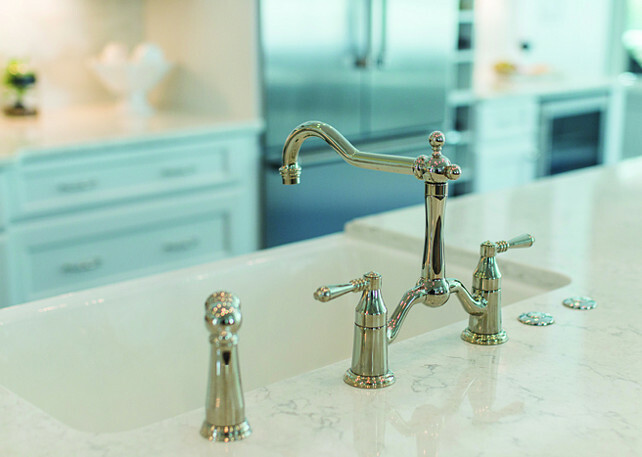 The Bridge kitchen faucet is the Brizo 62536LF-PC Tresa Kitchen Faucet Double Handle with Metal Lever Handles and Side Spray in Chrome. This is a Nottaway 5″ plank handscraped distressed engineered wood floor. The kitchen backsplash is Marble M190 – First Snow Honed. 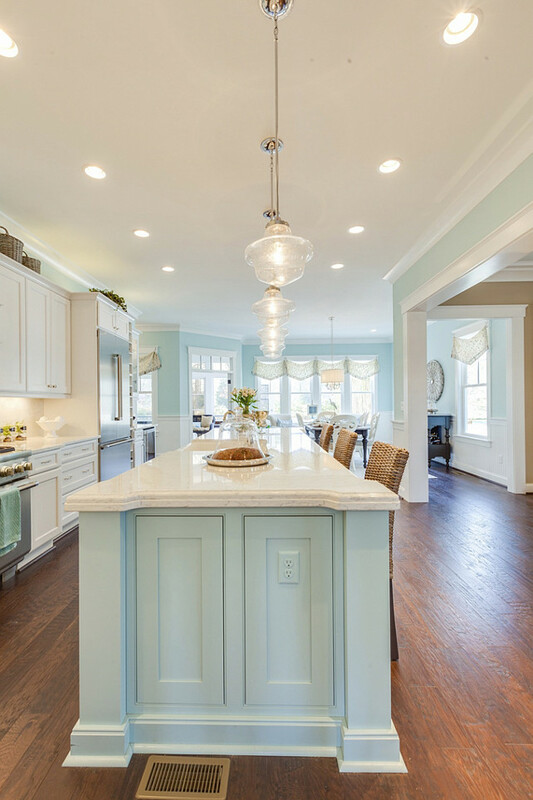 It’s always a good idea to paint your light switch covers and outlets to match your kitchen island. 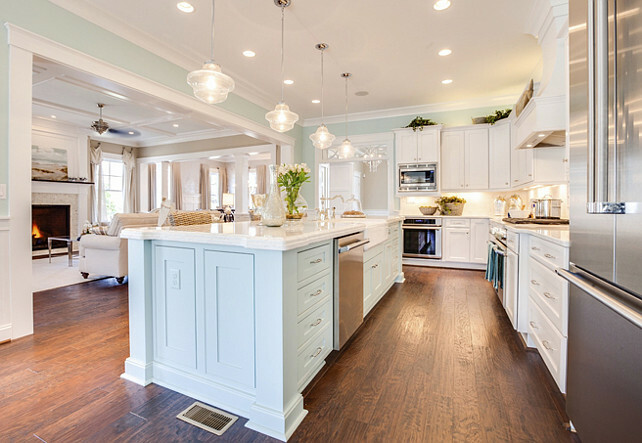 These stunning vintage-inspired school house pendants provide great light over the kitchen island. They’re by Progress Lighting. 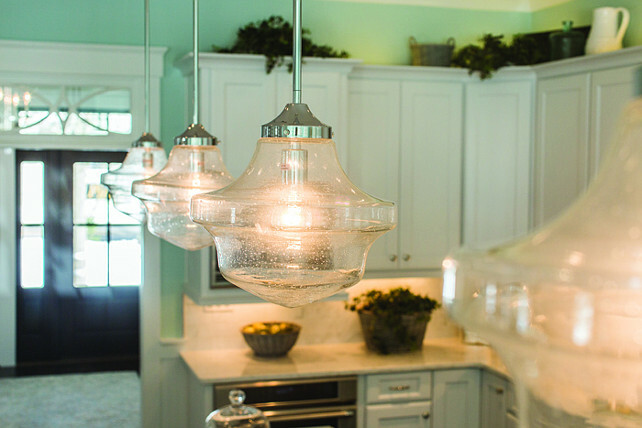 The kitchen is made bright with on-trend clear glass pendants from the Progress Lighting Academy collection. The simple school house shape adds to the kitchen’s simple chic appeal. 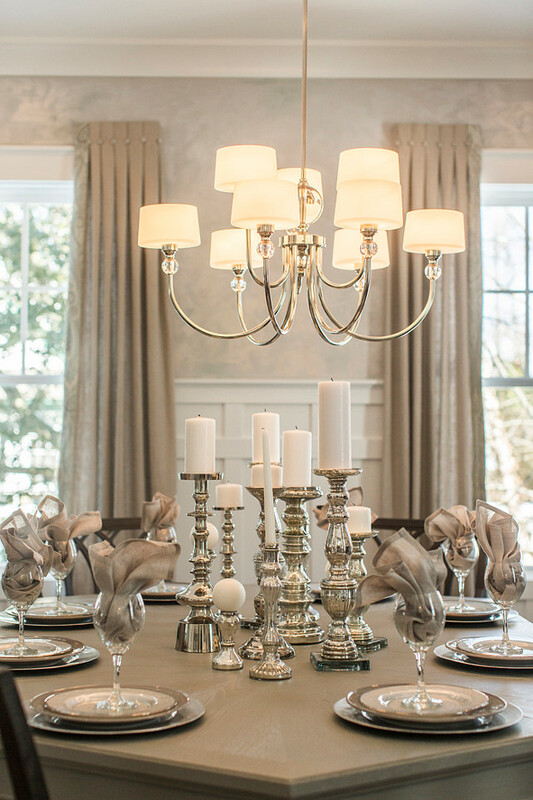 Just off the kitchen is a table setting united by an elegant shade surrounding Progress Lighting’s Nissé chandelier. I can see myself reading the paper or a good book seating in one of the chairs by the window. This would be my favorite spot in the house. 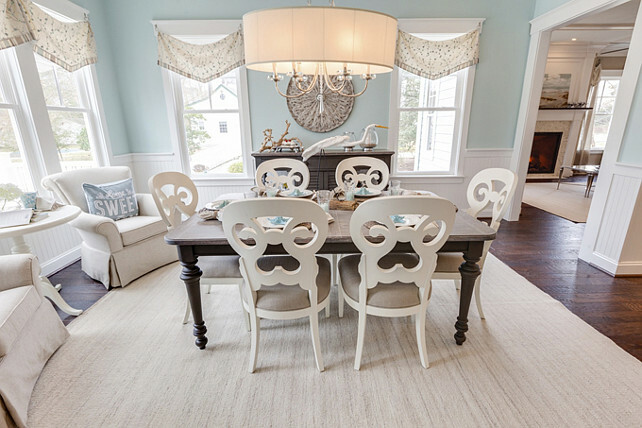 With a color palette of sand and soft aqua blue in varying combinations, the eating nook carries the same elements we see in the rest of the house. This is definitely a serene place! Of course, no coastal home is complete without an inviting outdoor space. The Idea House’s back porch blurs the line between inside and out and leads the way to a half-acre lot landscaped with native vegetation. 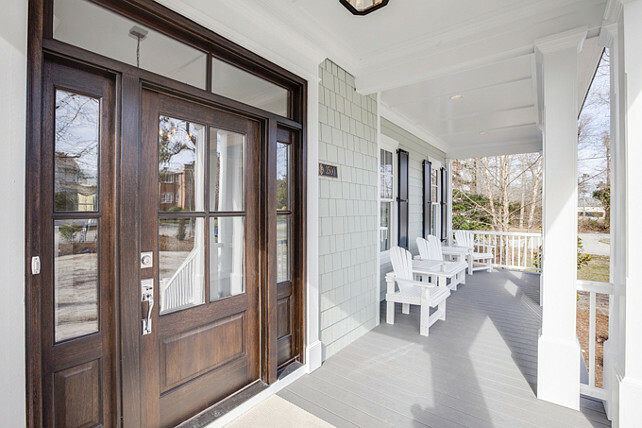 A fully fenced front and backyard allows for ample privacy, and an outdoor shower complete with surfboard doors offers a space to rinse off before stepping back inside, onto the handscraped, wide-plank hardwoods. The deck used here is Trex composite with hidden fasteners. 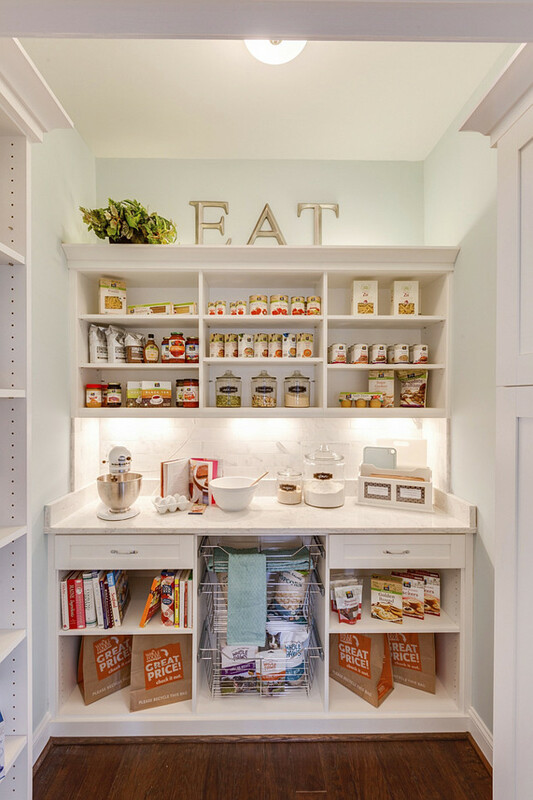 The layout and elements used in this pantry is surely very inspiring. Notice the marble countertop and marble tile backsplash. 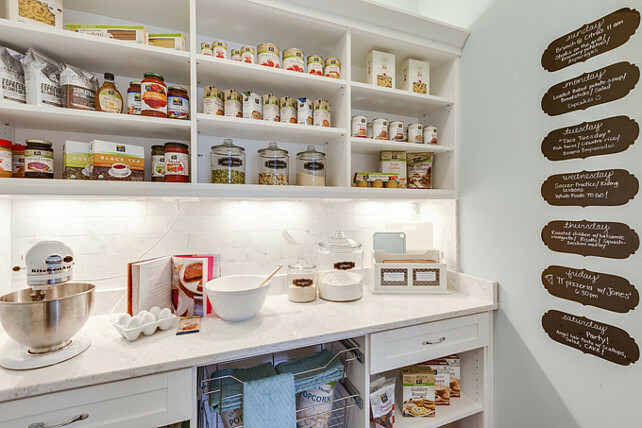 This pantry also feautures appliance shelf and metal pull-out bins. I love the idea of using chalkboard decals for each day of the week for quick meal planning. This would make my life a little easier! 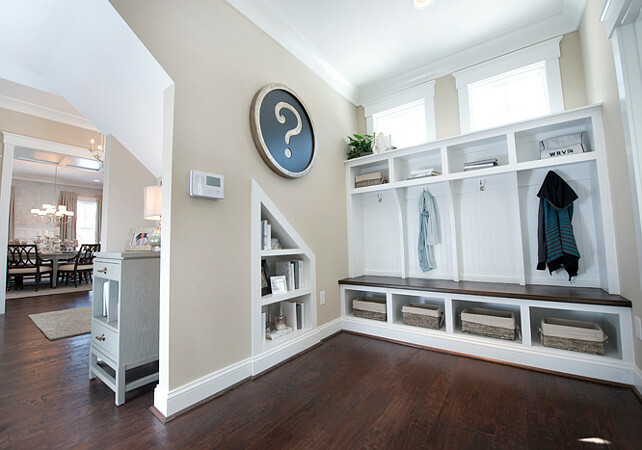 This mudroom has everything, including an oversized typewriter-key question mark art. So cute! 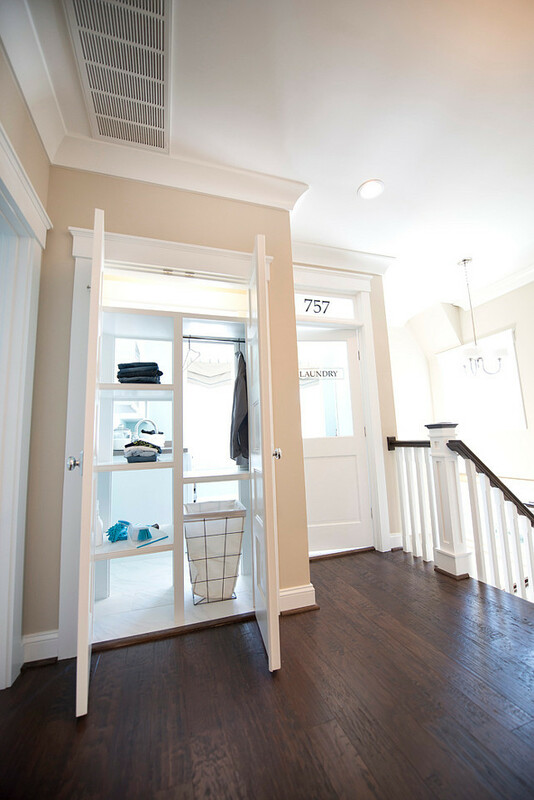 The mudroom, located just behind the staircase, features four built-in cubbies whose bench seating and dividers possess a distinctive and intentional church pew aesthetic. Fabric-lined baskets here and elsewhere camouflage would-be clutter as decorative objects with organic appeal. Nearby, under-stair storage is staged as bookshelves, but could be outfitted with more baskets or bins to serve as stylish catch-alls. 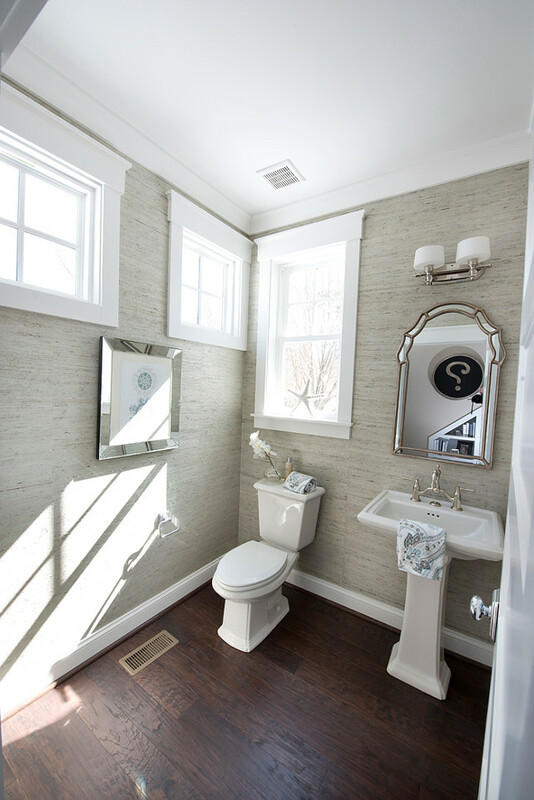 We rarely see powder rooms with good sized windows. This one has three and I think it’s wonderful! 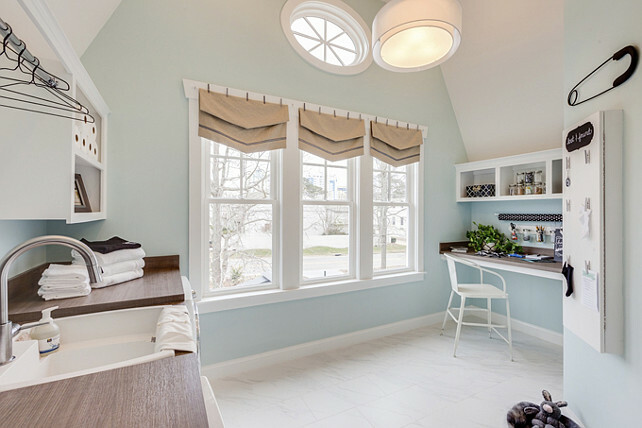 When designing a power room, make sure to add plenty of natural light. This is a must in any kind of bathroom. Grasscloth wallpaper brings a pearlized sheen in the powder room. 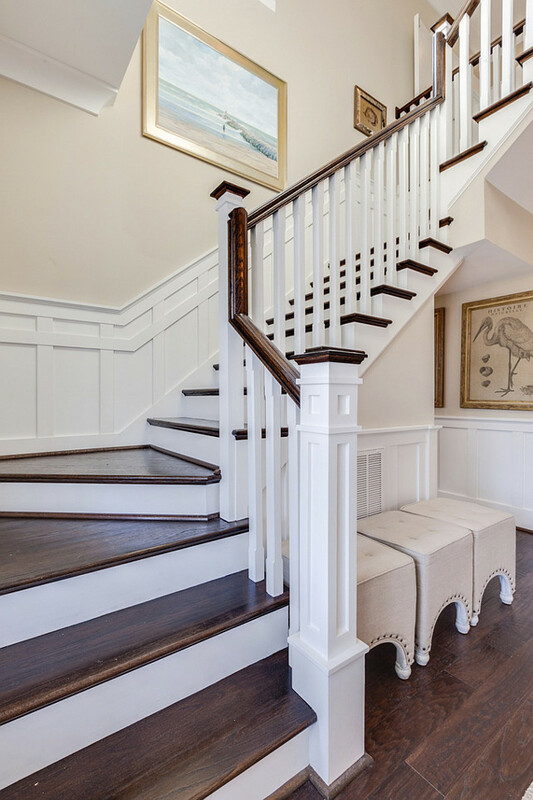 Stunning millwork and flooring was added to this staircase. I also like the simple idea of adding three linen covered stool as furniture. Very calming and “quiet”. Pass-through shelving accessible both from inside the laundry room and from just outside provides “get it yourself” convenience. This is such a smart idea! I would love to incorporate it at home. I might would want to make each shelf wider to place laundry baskets. Every family member would have their own shelf. 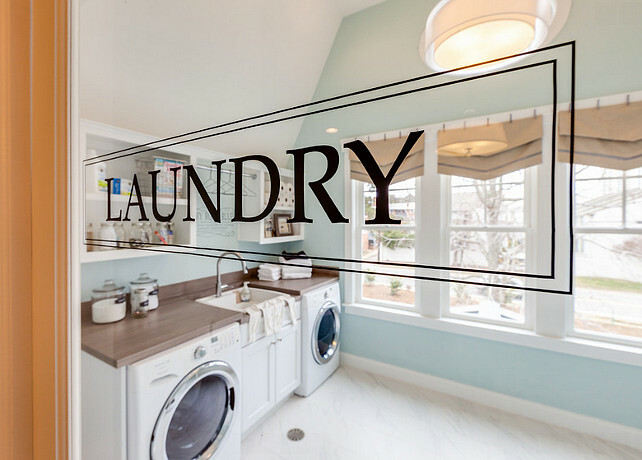 A door keeps any noise contained in this second-floor laundry room. Soft aqua blue walls further open up this sunny space with its vast windows and soaring ceiling, while black and white accents offer a spunky, retro feel. 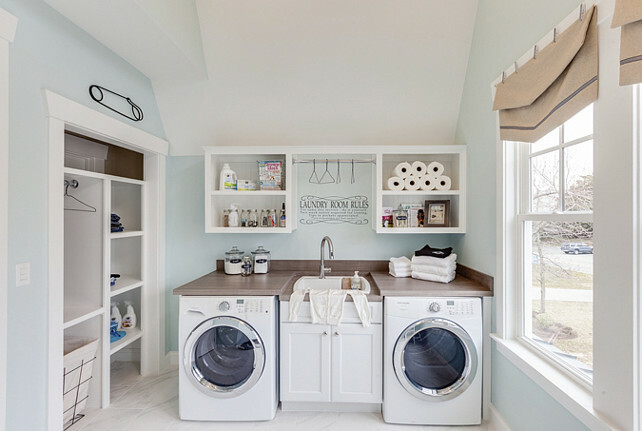 With 13-foot ceilings, this laundry room double as pretty much anything—craft suite, scrapbooking room, DIY headquarters and more. 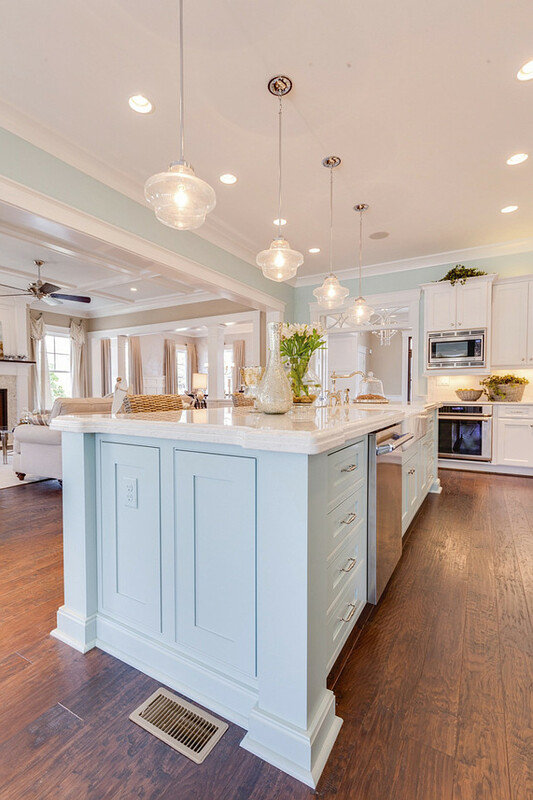 This soothing aqua blue paint color is ideal for coastal interiors. The paint color is Tidewater by Sherwin Williams. Wall-mounted clothespins display orphaned socks. I adore this idea! Mason and apothecary jars provide sensible storage with a nostalgic nod. In the Boy’s Bedroom, the team fashioned materials from a local home improvement store into witty and serviceable furnishings. 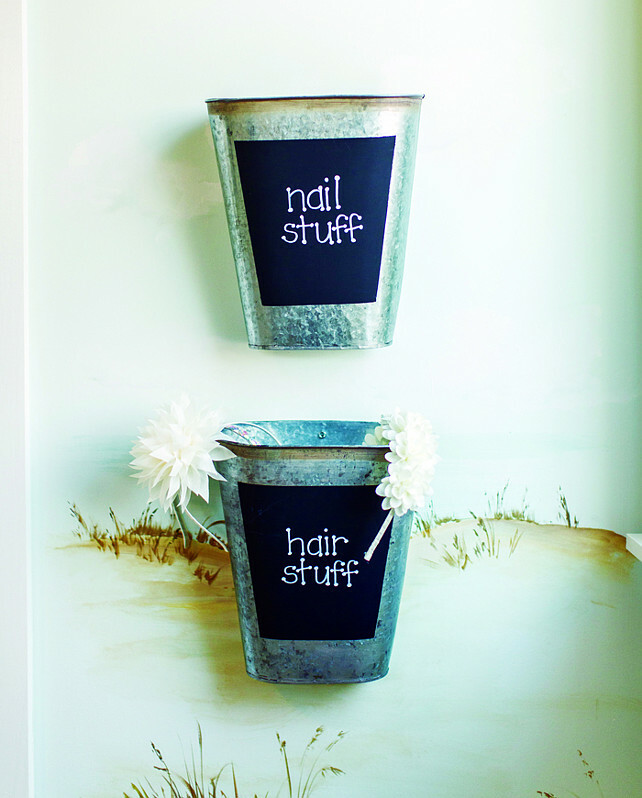 Two galvanized metal buckets glued together top-to-top form a nightstand that doesn’t take up a lot of horizontal space and galvanized plumbing pipes and fittings make a handsome, full-size headboard. Both add a little shine as well as an industrial vibe, palatable to most boys. 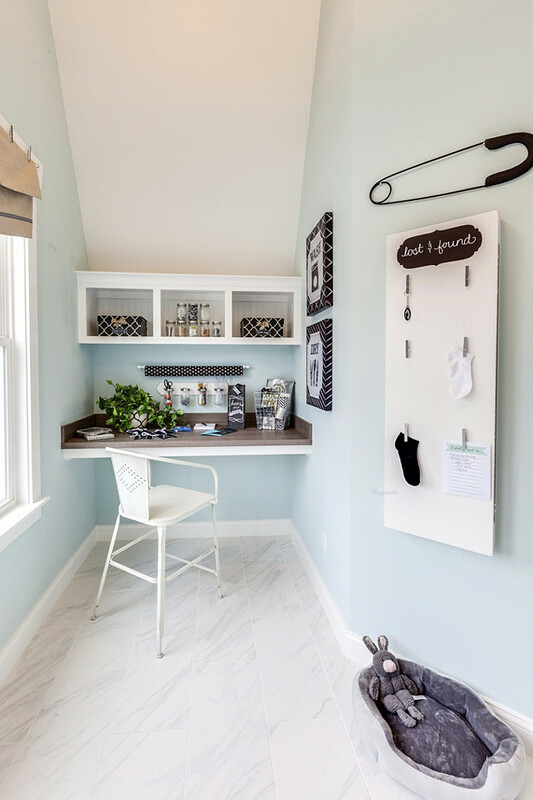 A framed cork display strip encircles the room and wall-mounted nautical cleats from a local discount department store serve as hooks for clothing, hats and backpacks. Above trim: Sherwin Williams SW7547 Sandbar and wall bellow trim is Sherwin Williams SW6478 Watery. 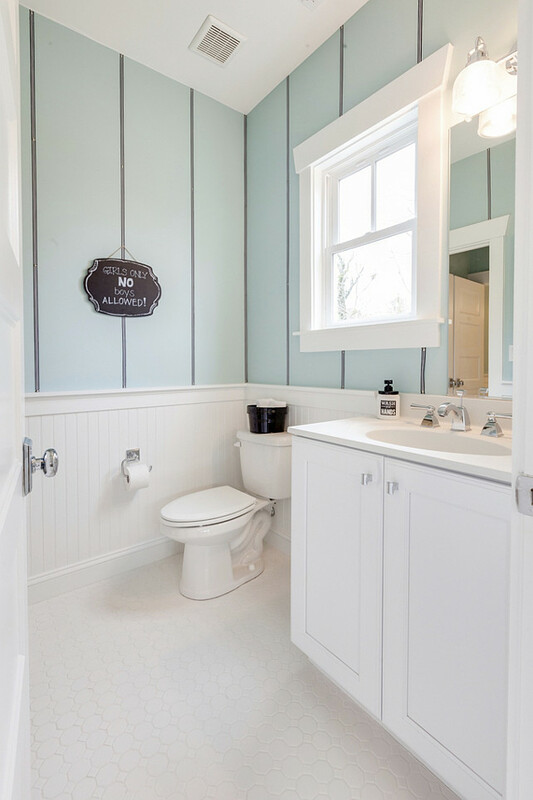 In this bathroom black and white grosgrain ribbon tacked at regular intervals creates a clever striped wall treatment, and various quotes and quips on blackboard plaques and labels make playful points about privacy, hygiene, and what sundries go where, e.g. “Girls Only No Boys Allowed” in Jill’s half and the reverse in Jack’s, “Wash Your Hands”. 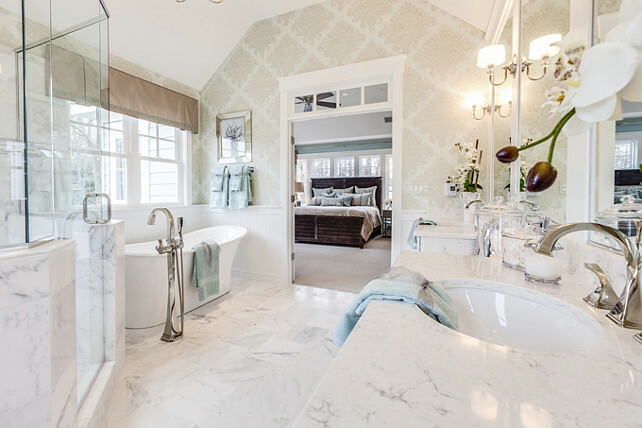 Classic white floor tiles add a timeless feel to this bathroom. In the Girl’s Bedroom, murals painted by Cathy Cox of Brushstrokes and wall-mounted three-dimensional letters spelling out “Keep Calm and Ride On” establish an equestrian theme both beautiful and whimsical with links to the coastal Virginia wild pony culture. Paint Color is Glimmer by Sherwin Williams. 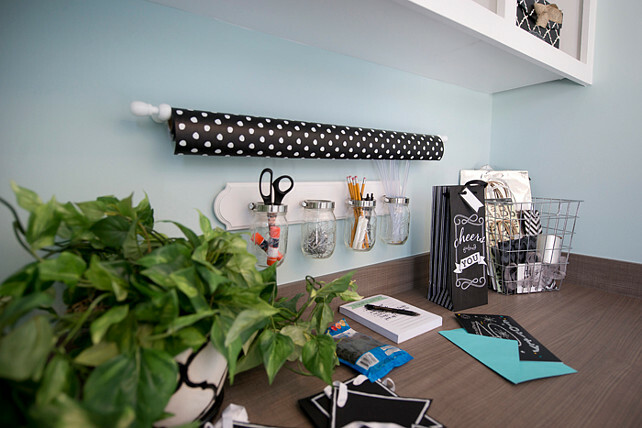 Create fun opportunities to teach your kids to be organized. 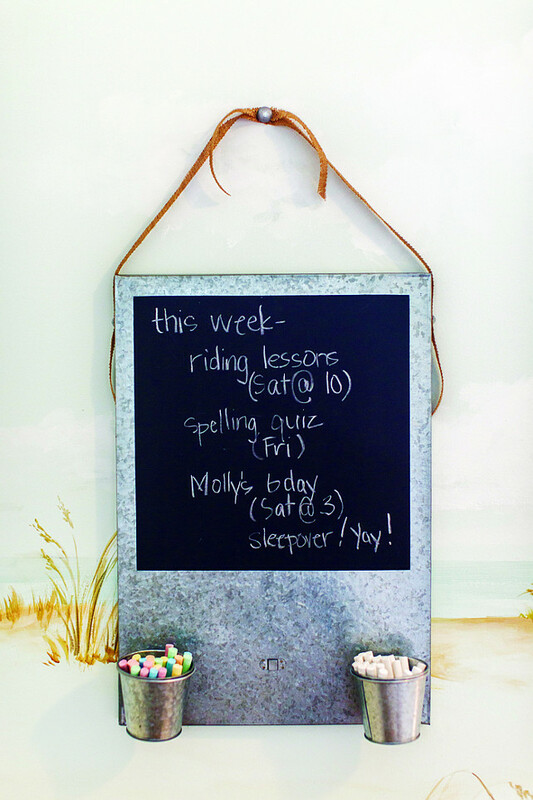 This girl’s bedroom has a DIY chalk board message to display her weekly schedule. 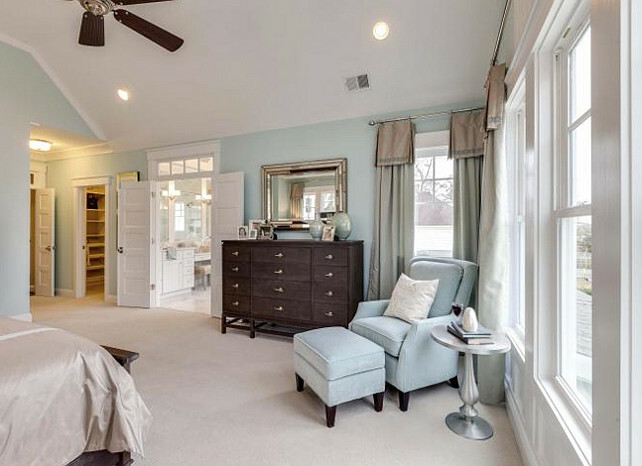 This bedroom features a very soothing decor. The paint color is Sherwin Williams SW 6477 Tidewater. Notice the layout of this space. Immediately adjacent, an exquisite crushed volcanic rock soaking tub with impossibly simple and graceful lines evokes the footed tubs of yesteryear but with a profile that is somewhat sleeker. The freestanding tub filler is the Brizo Virage: Single-Handle Freestanding Tub Filler. 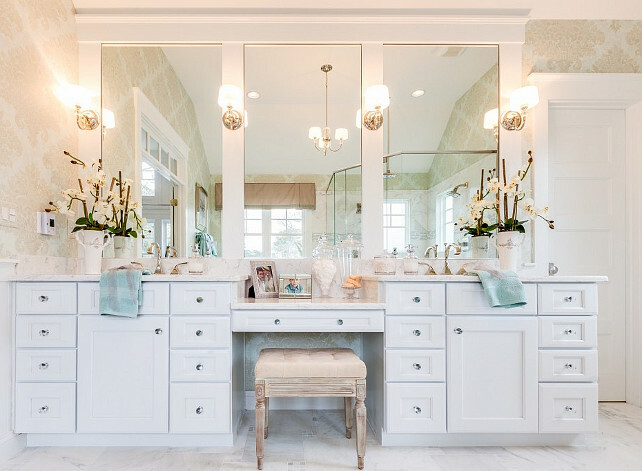 How would you like to wake up to this vanity set-up every morning? Featuring Progress Lighting Fortune sconces. 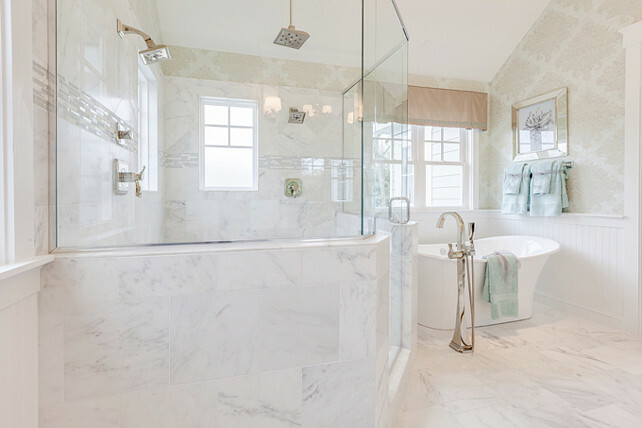 Soaking tub, glass shower, mini-chandelier (from the Progress Lighting Fortune collection), marble floors – this master bath embodies spa-like luxury! 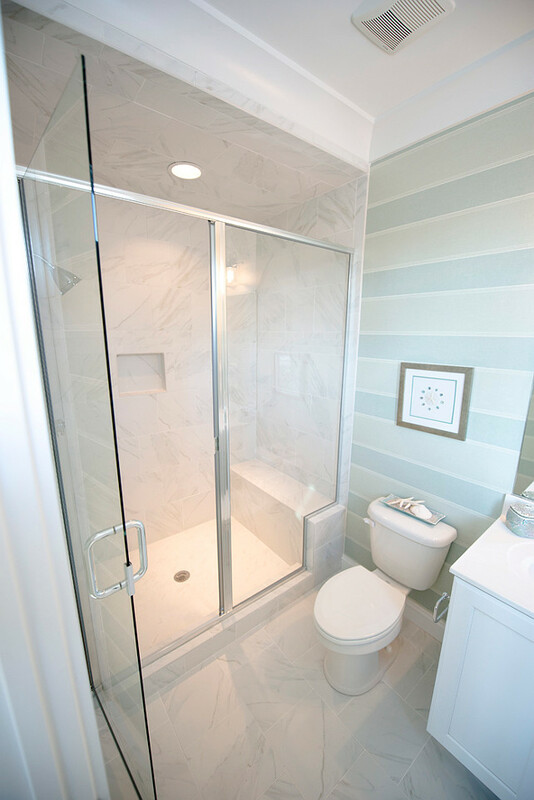 Placing a shower in the corner allows you to design a spacious shower with a practical layout. The decor in this coastal bedroom was kept easy and casual. I love the sand paint color with the turquoise bedding. Paint Color is SW7506 Loggia. 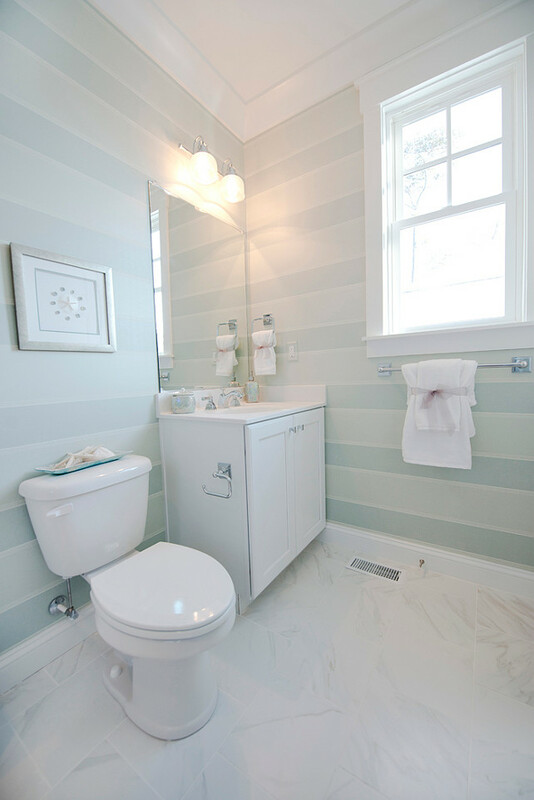 Striped walls look good in any space, including small ones. 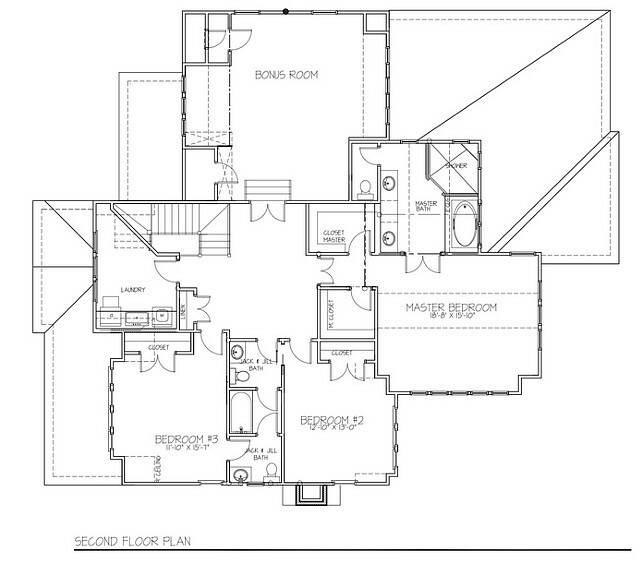 This is a good example of small bathroom layout. Notice that the shower even features a seating area. In the upstairs family room designed as a blended family space inviting to both kids and adults, clever décor comes in a variety of flavors: a custom subway sign that Wilson describes as a “fun way to refer to the regionalism of the area, jars of sand from various surfing beaches, and a “money jar” to collect change for the next family vacation. 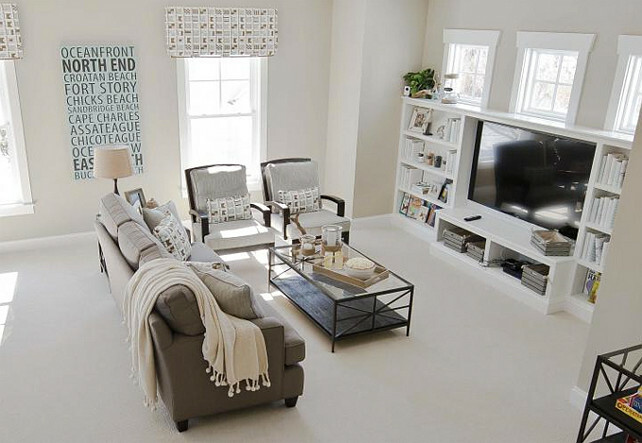 The paint color in this neutral family room is Sherwin Williams Sandbar. Spending some time together is always the best way to enjoy the features of your home. When building a house, every detail counts! For the insulation, the builder used blown cellulose and closed cell spray foam on the exterior walls making the home extremely affordable to heat & cool. The spray foam adds substantial rigidity to the structure as well. 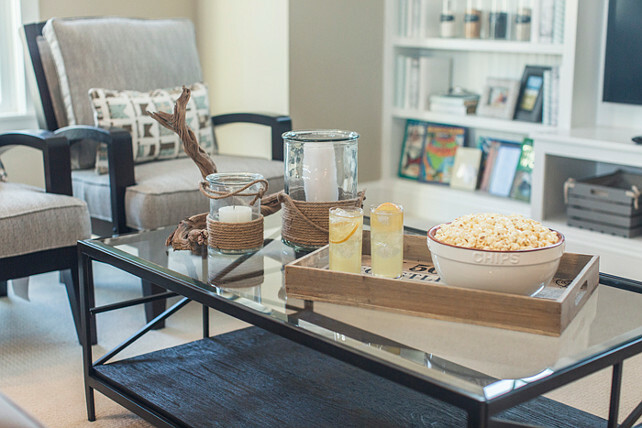 This home carries a coastal nostalgic style with its simple, uncluttered, but upscale interior. Isn’t this home amazing? I fell in love with it! By the way, this beach house is for sale for 1,275,000. I hope you have a very Blessed day, my friends. Thank you so much for being here today. We’ll talk some more tomorrow. Sources: House of Turquoise. Home Stories A to Z. Architecture by Retnauer Baynes Associates, LLC. Coastal Virginia Magazine, Stephen Alexander Homes & Neighborhoods. Amazing home! Thank you for sharing it! What a beautiful home, Luciane. 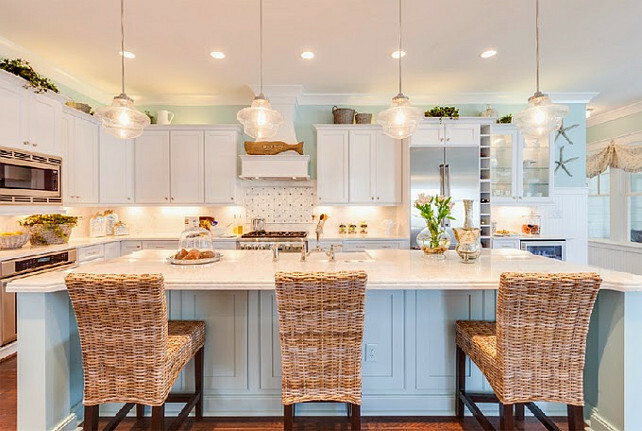 Just love the warm and inviting feel and the kitchen is amazing. So fun how they painted the island blue! So happy you and Karen are having fun – nothing like wonderful friends…Hope you’re having a great week!! What are the exterior paint colors? Unfortunately I don’t have the info on the exterior paint color. Please try to contact the builder. he might share this with you. I love this house…everything about it. 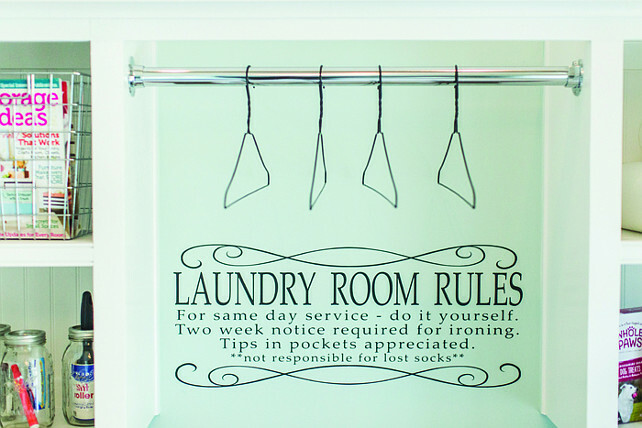 Could you tell me where you found the laundry rules..so cute and also the wooden bed frame…Love love it all. Thank you so much for sharing!! !